The Plyo Floor is a cushioned floor that maximizes quickness and explosiveness while improving dynamic stability. This floor is a potent development tool for dramatically improving powerful movement, expanding your movement base and developing dynamic stability. The Athletic Republic Plyo Floor (PF) also utilizes quick lock resistance cord hooks to maximize quickness and explosiveness while improving dynamic stability, essential for improving movement skills and overall athleticism. 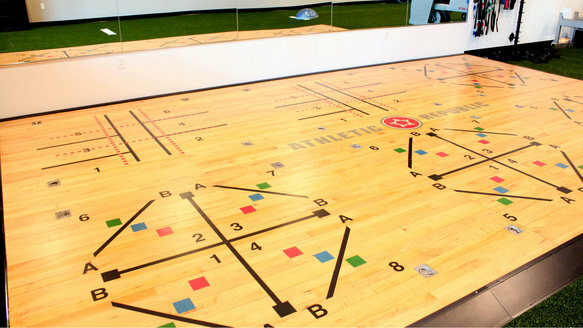 The dynamic of this floor allows our trainers to gauge just how far your range of movement can go as well as your balance, speed and footwork ability. Each session on the Plyo Floor is modified to fit your specific need and skill level. From football to soccer the plyo floor is the perfect footwork improvement tool for any athlete in or out of season.